I've always been in awe of Costco outlets. Back in India, we had nothing even close to those kind of outlets. When we moved to Australia, I was eager to get into one. I had also heard that shopping at Costco meant buying huge quantities and it was a while before I had the space for larger quantities. But a few months ago, when we moved, we finally had the space needed and we made our first trip to Costco. For someone like me, who loves grocery shopping (There, I said it. Please don't hate me), Costco was a grocery shopper's heaven. From the time I set foot in it, I loved it. Fortunately for me, my husband enjoys our trips there too. On our last trip, I found some crab meat there and picked some up. I've been longing to try some recipes for crab cakes, crab dip and crab rangoon, to name a few crab dishes. And while we always have fresh crabs available, I have been on the look out for some crab meat. It quickens the process and makes it easier. So buying crab meat was a no-brainer for me. 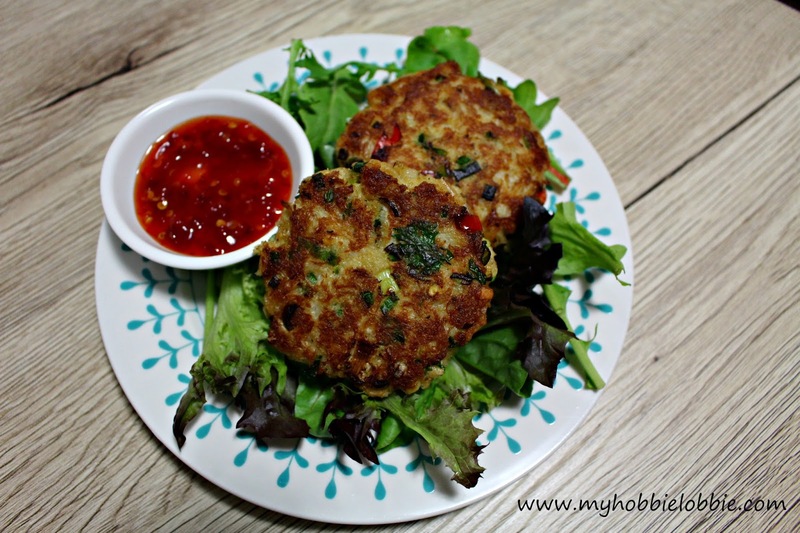 Recently, after a busy day of flower making, I found myself looking for a quick and easy dinner option and decided to make some crab cakes. I found a recipe I thought would be really nice and decided to try it out. In a few minutes, I was frying up some gorgeous crab cakes. I served these crab cakes up with some sweet chilly sauce, some salad greens and bread. I loved how these crab cakes turned out. They were full of flavor and I had a delicious meal on the table in about 30 minutes. That's a winner of a dish for me. You wanna hear a little secret? They would make fantastic burgers. A couple of spoons of olive oil, to pan fry the patties. In a large mixing bowl, place all the ingredients, except the olive oil, salad leaves and sweet chilli sauce. Mix it all together till everything is evenly distributed. Mix thoroughly but gently. Heat a spoon of olive oil in a pan on medium heat. Form the mix into crab cakes and place on the pan. You may need to do this in batches. Let the crab cakes fry till golden brown, about 3-4 minutes. Carefully flip the crab cakes and fry on the other side till golden brown as well. Serve them up with some salad leaves, sweet chilly sauce and some bread, if desired.